Naloxone hydrochloride, a narcotic antagonist, is a synthetic congener of oxymorphone. In structure it differs from oxymorphone in that the methyl group on the nitrogen atom is replaced by an allyl group. Naloxone Hydrochloride Injection is available as a non-preserved sterile solution for intravenous, intramuscular or subcutaneous administration, in the 0.4 mg/mL and 1 mg/mL concentrations. Each mL of the 0.4 mg strength contains 8.6 mg of sodium chloride. Each mL of the 1 mg strength contains 8.35 mg of sodium chloride. The pH is adjusted with hydrochloric acid to meet USP limits of 3.0 to 4.5. Naloxone hydrochloride is an essentially pure narcotic antagonist, i.e., it does not possess the "agonistic" or morphine-like properties characteristic of other narcotic antagonists; naloxone does not produce respiratory depression, psychotomimetic effects or pupillary constriction. In the absence of narcotics or agonistic effects of other narcotic antagonists it exhibits essentially no pharmacologic activity. Naloxone has not been shown to produce tolerance nor to cause physical or psychological dependence. In the presence of physical dependence on narcotics naloxone will produce withdrawal symptoms. When naloxone hydrochloride is administered intravenously the onset of action is generally apparent within two minutes; the onset of action is only slightly less rapid when it is administered subcutaneously or intramuscularly. The duration of action is dependent upon the dose and route of administration of naloxone hydrochloride. Intramuscular administration produces a more prolonged effect than intravenous administration. The requirement for repeat doses of naloxone, however, will also be dependent upon the amount, type and route of administration of the narcotic being antagonized. 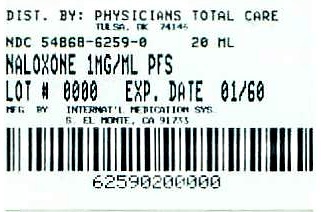 Naloxone hydrochloride injection is indicated for the complete or partial reversal of narcotic depression, including respiratory depression, induced by opioids including natural and synthetic narcotics, propoxyphene, methadone and certain narcotic-antagonist analgesics: nalbuphine, pentazocine and butorphanol. Naloxone hydrochloride is also indicated for the diagnosis of suspected acute opioid overdosage. Naloxone hydrochloride injection may be useful as an adjunctive agent to increase blood pressure in the management of septic shock. Naloxone hydrochloride injection is contraindicated in patients known to be hypersensitive to it. Naloxone hydrochloride should be administered cautiously to persons including newborns of mothers who are known or suspected to be physically dependent on opioids. In such cases an abrupt and complete reversal of narcotic effects may precipitate an acute abstinence syndrome. The patient who has satisfactorily responded to naloxone should be kept under continued surveillance and repeated doses of naloxone should be administered, as necessary, since the duration of action of some narcotics may exceed that of naloxone. Naloxone is not effective against respiratory depression due to non-opioid drugs. Reversal of buprenorphineinduced respiratory depression may be incomplete. If an incomplete response occurs, respirations should be mechanically assisted. In addition to naloxone, other resuscitative measures such as maintenance of a free airway, artificial ventilation, cardiac massage, and vasopressor agents should be available and employed when necessary to counteract acute narcotic poisoning. Several instances of hypotension, hypertension, ventricular tachycardia and fibrillation, and pulmonary edema have been reported. These have occurred in postoperative patients, most of whom had pre-existing cardiovascular disorders or received other drugs which may have similar adverse cardiovascular effects. Although a direct cause-and-effect relationship has not been established, naloxone should be used with caution in patients with pre-existing cardiac disease or patients who have received potentially cardiotoxic drugs. Carcinogenicity and mutagenicity studies have not been performed with naloxone hydrochloride. Reproductive studies in mice and rats demonstrated no impairment of fertility. Reproduction studies performed in mice and rats at doses up to 1,000 times the human dose revealed no evidence of impaired fertility or harm to the fetus due to naloxone. There are, however, no adequate and well-controlled studies in pregnant women. Because animal reproduction studies are not always predictive of human response, naloxone hydrochloride should be used during pregnancy only if clearly needed. There is no clinical experience with naloxone hydrochloride overdosage in humans. In the mouse and rat the intravenous LD50 is 150 ± 5 mg/kg and 109 ± 4 mg/kg respectively. In acute subcutaneous toxicity studies in newborn rats the LD50 (95% CL) is 260 (228â€“296) mg/kg. Subcutaneous injection of 100 mg/kg/day in rats for 3 weeks produced only transient salivation and partial ptosis following injection: no toxic effects were seen at 10 mg/kg/day for 3 weeks. Naloxone hydrochloride injection may be administered intravenously, intramuscularly, or subcutaneously. The most rapid onset of action is achieved by intravenous administration, and it is recommended in emergency situations. Since the duration of action of some narcotics may exceed that of naloxone, the patient should be kept under continued surveillance and repeated doses of naloxone should be administered, as necessary. Naloxone hydrochloride injection may be diluted for intravenous infusion in Sodium Chloride Injection 0.9% or Dextrose Injection 5%. The addition of 2 mg of naloxone in 500 mL of either solution provides a concentration of 0.004 mg/mL. Mixtures should be used within 24 hours. After 24 hours, the remaining unused solution must be discarded. The rate of administration should be titrated in accordance with the patient's response. Parenteral drug products should be inspected visually for particulate matter and discoloration prior to administration whenever solution and container permit. Naloxone hydrochloride injection should not be mixed with preparations containing bisulfite, metabisulfite, long-chain or high-molecular-weight anions, or any solution having an alkaline pH. No drug or chemical agent should be added to naloxone hydrochloride injection unless its effect on the chemical and physical stability of the solution has first been established. An initial dose of 0.4 mg to 2 mg of naloxone hydrochloride may be administered intravenously. If the desired degree of counteraction and improvement in respiratory functions is not obtained, it may be repeated at 2 to 3 minute intervals. If no response is observed after 10 mg of naloxone hydrochloride have been administered, the diagnosis of narcotic-induced or partial narcotic-induced toxicity should be questioned. Intramuscular or subcutaneous administration may be necessary if the intravenous route is not available. For the partial reversal of narcotic depression following the use of narcotics during surgery, smaller doses of naloxone hydrochloride are usually sufficient. The dose of naloxone hydrochloride should be titrated according to the patients response. Naloxone hydrochloride should be injected in increments of 0.1 to 0.2 mg intravenously at two to three minute intervals to the desired degree of reversalâ€”i.e., adequate ventilation and alertness without significant pain or discomfort. Larger than necessary dosage of naloxone may result in significant reversal of analgesia and increase in blood pressure. Similarly, too rapid reversal may induce nausea, vomiting, sweating, or circulatory stress. Repeat doses of naloxone may be required within one- to two-hour intervals depending upon the amount, type (i.e., short- or longacting) and time interval since last administration of narcotic. Supplemental intramuscular doses have been shown to produce a longer lasting effect. The usual initial dose in children is 0.01 mg/kg body weight given I.V. If this dose does not result in the desired degree of clinical improvement, a subsequent dose of 0.1 mg/kg body weight may be administered. If an I.V. route of administration is not available, naloxone may be administered I.M. or S.C. in divided doses. If necessary, naloxone hydrochloride injection can be diluted with sterile water for injection. Follow the recommendations and cautions under "Adult Postoperative Depression." For the initial reversal of respiratory depression naloxone hydrochloride should be injected in increments of 0.005 mg to 0.01 mg intravenously at two- to three-minute intervals to the desired degree of reversal. When using naloxone hydrochloride injection in Neonates a product containing 0.02 mg/mL should be used. The usual initial dose is 0.01 mg/kg body weight administered I.V., I.M., or S.C. This dose may be repeated in accordance with adult administration guidelines for postoperative narcotic depression. 2 mL single dose disposable Luer-Jetâ„¢ Luer-Lock Prefilled Syringe. 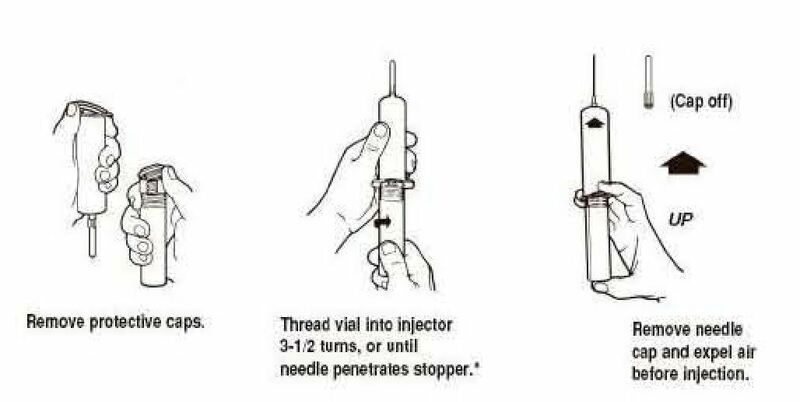 The MIN-I-JET® syringe with needle, illustrated below, is the basic unit upon which all the other syringe systems are built; slight adaptations and/ or additional auxiliary parts createthe other syringe systems. Assembly directions remain essentially the same. Do not assemble until ready to use. *CAUTION: IMPROPER ENGAGING MAY CAUSE GLASS BREAKAGE AND SUBSEQUENT INJURY. Protect from light. Store at controlled room temperature 15° to 30°C (59° to 86°F) [see USP].